Provenance / Collectors' marks: Unidentified collector’s mark (recto, lower right). The image depicts Jean de La Bruyére, born 1645. Bibliography: Portalis and Beraldi (vol. 1, p. 25); F.-D. I, 9, 37? ; see Carlson and Ittmann, cat. 111. 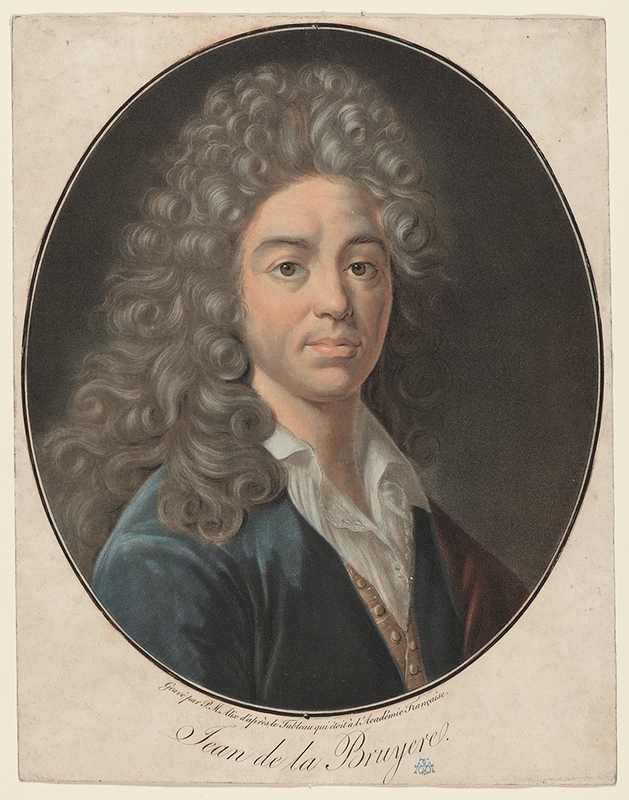 Portrait of Jean de La Bruyére, . Color mezzotint and mixed methods with hand coloring on wove paper. Plate: 250 x 208 mm (9.8 x 8.2 in.). Sheet: 274 x 214 mm (10.8 x 8.4 in.). DAC accession number 1944.D1.2. Gift of George W. Davison (B.A. Wesleyan 1892), 1944. Open Access Image from the Davison Art Center, Wesleyan University (photo: M. Johnston). http://dac-collection.wesleyan.edu/obj180 is a persistent link to this page with no user-session information.